Western blot analysis of extracts from HeLa cells transfected with 100 nM control siRNA #6201 (-) or p44 MAPK (Erk1) siRNA (+), using p44/42 MAPK (Erk1/2) Antibody #9102 and GCK Antibody #3782. The Erk1/2 antibody confirms silencing of Erk1 expression, and GCK Antibody is used to control for loading and specificity of p44 MAPK (Erk1) siRNA. 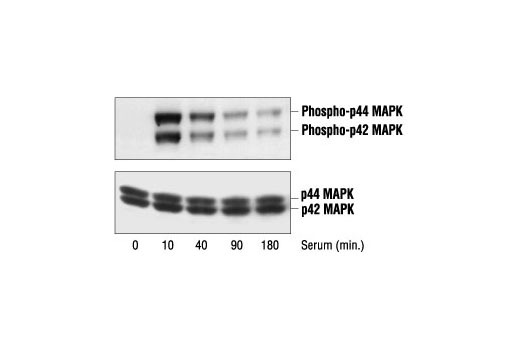 Western blot analysis of extracts from serum-induced PC12 cells, using Phospho-p44/42 MAPK (Erk1/2) (Thr202/Tyr204) Antibody #9101 (upper) or control p44/42 MAPK (Erk1/2) Antibody (lower). 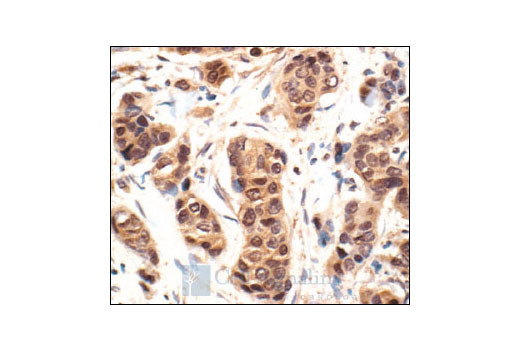 Immunohistochemical analysis of paraffin-embedded human breast carcinoma, showing nuclear and cytoplasmic localization, using p44/42 MAPK (Erk1/2) Antibody. 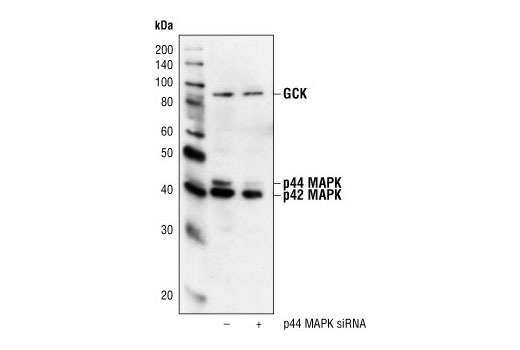 p44/42 MAPK (Erk1/2) Antibody detects endogenous levels of total p44/42 MAP kinase (Erk1/Erk2) protein. In some cell types, this antibody recognizes p44 MAPK more readily than p42 MAPK. The antibody does not recognize either JNK/SAPK or p38 MAP kinase. Polyclonal antibodies are produced by immunizing animals with a synthetic peptide corresponding to a sequence in the C-terminus of rat p44 MAP Kinase. Antibodies are purified by protein A and peptide affinity chromatography.